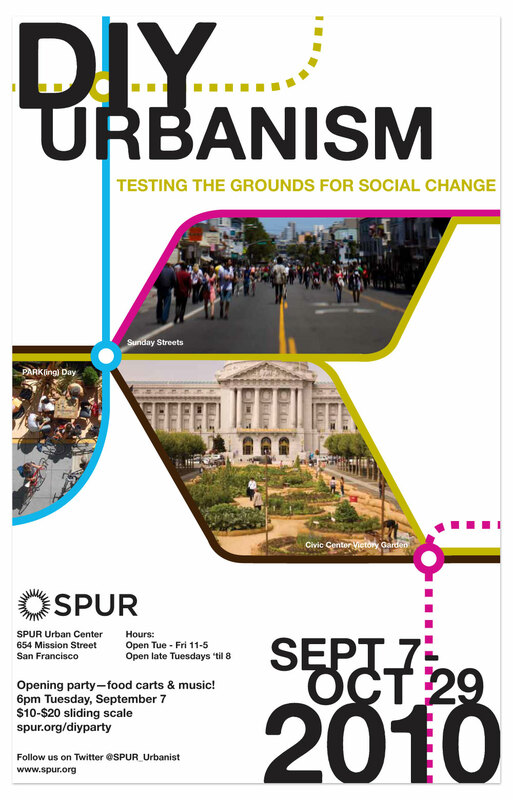 In 2010, SPUR approached Rebar to design an exhibition that examines the mobilization of do-it-yourself urbanists in the face of great economic challenges that threatened to stagnate city planning and urban activation. The designers and artists included in DIY Urbanism: Testing the Grounds for Social Change are incredibly local and community-focused, yet together these projects reveal the ways in which small or finite efforts can blossom into larger-scale, ongoing transformations. The design of the space and the marketing collateral was inspired by the notion of phsyically trekking to each locale, imagining their literal and figurative connections, and acknowledging the back-and-forth influence individual efforts have on a larger movement.